Since the stew cooks rapidly, start by cleaning the seafood. 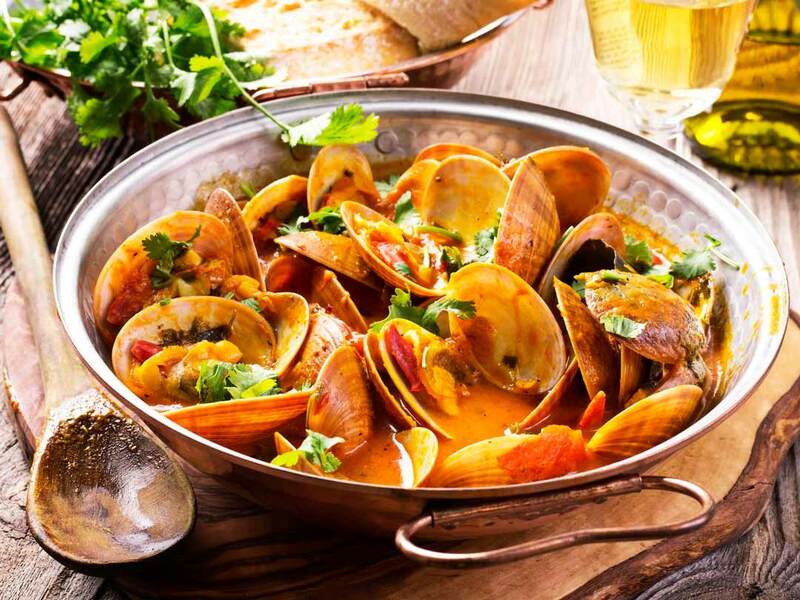 Scrub the clams under running water with a brush, and soak the mussels for 30 minutes in a bowl of cold water. Sprinkle with the cornmeal or flour. Scrub the mussels & trim off the beards with a sharp paring knife. Peel & de-vein the shrimp. Remove the lobster tails from their shells, de-vein & split lengthwise. Cover the pot, and once it returns to a boil turn the heat down & allow it to simmer, covered, for 10 minutes. Discard any clams or mussels that have not opened. While the stew is cooking, grill the tortillas on a hot griddle or in a skillet & press 1 tortilla into each serving bowl. Top the tortilla with _ cup rice. To serve, divide the fish & seafood among the bowls, then add the broth & vegetables. Top with crowns of lemon & lime, a sprig of cilantro & a whole crawfish.